Despite a rain-filled opening two months of the fall thoroughbred meet at Hawthorne and a cancellation of the closing day card due to extreme cold temperatures, both handle and field size saw significant increases as the meet concluded on December 29. Total daily handle for 36 day fall meet averaged $1,708,081, up 9.17% from the $1,564,655 wagered per racing day in the fall of 2016. While the poor weather led to a slight onsite decrease of 5% from $54,031 per card in 2016 to $51,284 per card this fall, In-state handle rose 3.74%, $105,305 this fall compared to $101,510 in the fall of 2016. Out of state handle on Hawthorne’s races rose 10%, increasing to $1,551,492 this fall versus $1,409,114 wagered per day in the fall of 2016. Despite being able to contest only 27 races on the turf this fall, compared to 46 in 2016, average field size for the fall meet was 8.49 starters per race up from the average of 7.80 starters per race in 2016. With the help of grant funds from the Illinois Department of Agriculture, the 2017 fall meet also brought about the return of the stakes schedule. Longshot My Bariley kicked off the stakes season with a late closing score in the return of the Hawthorne Derby on October 28. Prado’s Sweet Ride and Goneghost were winners in the slop in the Illini Princess and Buck’s Boy Handicap respectively on November 4. 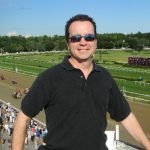 In the Showtime Deb, trainer Larry Rivelli saddled a winner in Richie’slilwildcat while RIvelli’s Pass the Gravy was the victor in the Sun Power Stakes. The grade 3 Hawthorne Gold Cup Handicap made its return on November 25 as 2016 Grade 2 Marathon winner Scuba got up in the shadow of the wire to catch Futile. On the Gold Cup day undercard, Shar Ran was the winner of the Powerless Handicap while Goneghost impressed again in winning the Lightning Jet Handicap. The fall stakes season closed out with Cowgirl Callie just holding on in the Pat Whitworth Illinois Debutante while Pass the Gravy stretched out to win the Jim Edgar Illinois Futurity. 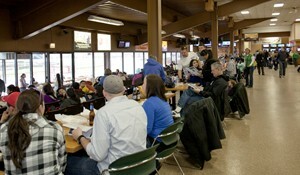 With the fall thoroughbred meet complete, there is no rest at Hawthorne. Immediately upon the conclusion of the meet, track maintenance crews and staff will be taking to the track to begin the track conversion to a Standardbred surface as Hawthorne is the final remaining track in the United States to race dual breeds over the same oval. 11,000 tons of dirt will be removed along with the Fontana safety rail as the track will be graded to a perfectly even consistency and pylons placed down, all in a 96 hour period in preparation for a January 5 start to the winter harness season.